Discussion in 'Food Plots for Wildlife' started by buckihunter302, Jun 26, 2018. I am planning to plant our new farm as follows: 2 lighter brown strips will be food plots, dark brown will be a screen of switch grass and egyptian what, 2 dark green fields will be row crops, 1 light green field will be alfalfa and the other sudan grass. I plan to have stands at the red dots. All that said, do you think the screen will be adequate to allow me access to the stands in the woods above the plots by walking along the east property line? Also, what are your thoughts on being able to get out, if they are hunted in the afternoon? Prevailing wind comes out of the west and I anticipate the area directly west of those stands to be used as heavy bedding. The entire field is planted in wheat currently that should be harvested in a couple weeks. The farmer that has the wheat will also be the one planting the row crops and hay. Just curious if I'm overlooking something when deciding how to orient my plot. Thanks! 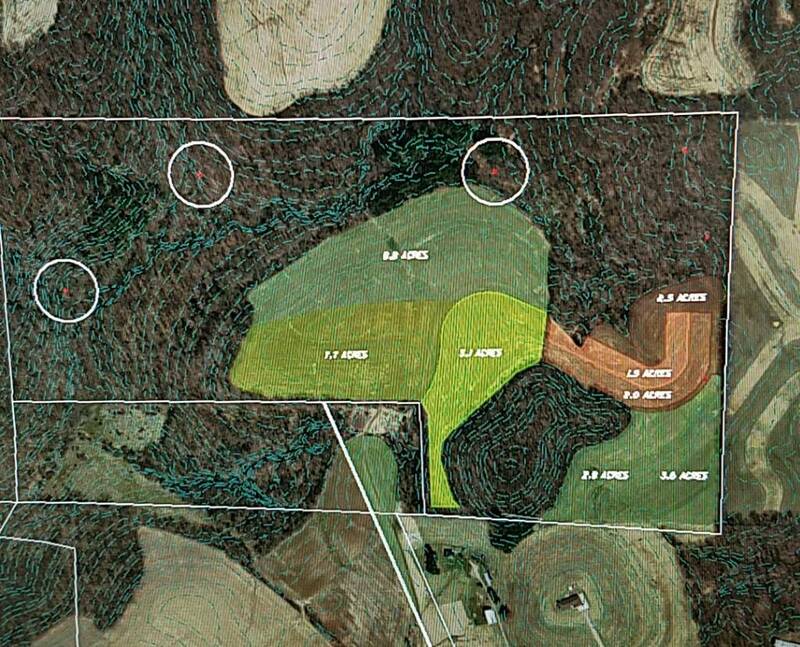 Stands and access routes need to be determined by where the deer are bedded and where they are anticipated to be going and the wind direction. That may change from am to pm and from feed to bed patterns to during the rut. Just keep in mind that while you walk to your stand, even if it is past one you are not hunting, you can be educating deer along the way with your scent. Also be aware of thermals as it appears you seem to be in some hill country. As for a screen.....I am not familiar with EW other than knowing its an annual that has to be replanted every year. I know my switchgrass only provides a true screen up to about 5 feet tall but as a perennial takes a few years to get there. Seed heads will get 6 feet or taller, but that isn't the actual screen height. If you need taller than that.....consider MG (Miscanthus Giganteus). Also consider a conifer component as cedars and spruce tend to make real good long term screens and tend to hold up better to ice, snow and wind as well. I transplant eastern red cedar all the time in the winter - consider CAR/fruit tree issues if you don't have cedar all ready. Chainsaw and Tap like this. Before you develop a plan, do a complete wind study so you truly understand what the wind is doing during different weather systems and wind speeds, during thermal shifts, and before/after leaf drop. Your terrain looks to be a bit complex. I'll bet a prevailing west wind isn't blowing from the west across the entire property. Milkweed is the best of all wind indicators. Powder bottles can't compare. Wind studies are best done with more than 1 person. Stay in contact with cell phones or walkie talkies so you can discuss and compare what is really happening, while its happening in each location. I'd venture to say that most hunters don't REALLY understand complex wind patterns on their properties. I'd also study how deer access and leave your property from the neighboring areas. I think that too often, we get tunnel vision and only look at our own property. We fail to see the big picture...especially during the seeking phase of the rut when bucks travel big miles daily. The stands on the left side of the picture look to be deep into your property meaning that all deer on your property downwind of you as you are on stand will peg that area as dangerous that is the land your scent is in and of course the specific spot you are sitting in. As Tap described a full wind study is a great step in designing your plan. We have a Miscanthus Giganteus (MG) screen and a switchgrass screen as well; For us the the switch is only four feet tall or so whereas the MG is much higher. We have experienced the same as j-bird that the MG is a much better screen for us compared to the switchgrass. Sorry, it's been a busy week and I haven't had time to respond yet. In regards to the screen on the east of the food plot, the plot is on the edge of a bowl and the screen will be along the crest of the hill. My access will be just over the hump, which should gain me a couple feet of "screen". Regardless, I'll look into the MG. As for the 2 stands on the west side, the South stand would be accessed by walking in a pretty good creek that will screen me until the last 10 yards. My thoughts are to hunt on a north wind and only with rising thermals. The area south of the stand is a virtual dead zone due to the steep creek bank. The stand overlooks a large funnel where they cross. I'm not in love with the stand to the north, but it's roughly 40 yards from the property line and the thought was to hunt with a south wind and blow scent off the property. I'm not opposed to moving it, but I'd really like to have a stand along the bench that parallels my property line above the creek.